There’s something nice about being in the middle of nowhere and feeling like you’re at the heart of somewhere. I had the honor to play Beer Snob at the Bridgewater Volunteer Fire Department fundraiser tonight in tiny Bridgewater, Conn. It’s not too far from New Milford, if that’s any reference for you. Beneath a large wooden pavilion with a roaring fire cracking on one side, a hundred or so people contributed to the cause and sampled beer and wine, traded local gossip, and appeared to have a blast. 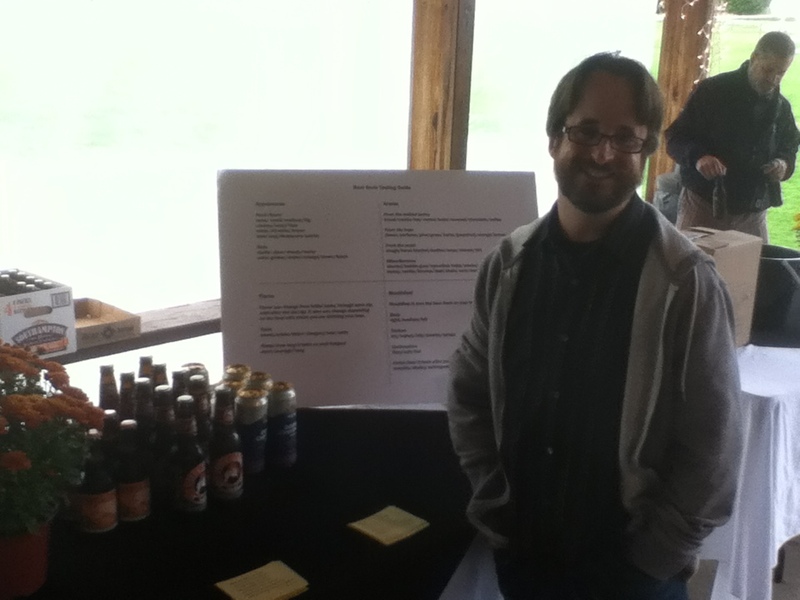 My special lady friend and I worked a table and I tried to educate those passing by about the differences between lagers and ales, why real pumpkin can sometimes hardly be noticed in a beer, the origin of the term stout, and what pairs best with a pilsner. Instead, I more or less helped pour, and tried to hand out a few business cards. We served Pilsner Urquell, Pyramid Octoberfest, Saranac Pumpkin Ale, Abita Pecan, City Steam Innocence, and Young’s Double Chocolate Stout. Next to me, a package store owner was passing out shots of whiskey, so it was just nice to at least be noticed. Stuff I learned: bring a working SD for your camera, serve crackers with your beer, and keep a sign-up sheet handy for direct marketing (I mean friendly e-mails). As we packed up for the night, I saw a few stragglers staring at the moon peeking out through dark gray clouds that held rain. They were holding hands and keeping each other upright. It was a tender, intoxicating sight. Unless that was just the buzz I got from drinking the unpoured samples. Whichever. It was touching. This entry was posted in Beer Snob and tagged Abita Brewing, Bridgewater, City Steam Brewing, Pilsner Urquell, Pyramid Brewing, Saranac Brewing, Young's. Bookmark the permalink.